KIEV, Ukraine -- The European Union on Monday balked at signing a landmark cooperation agreement with Ukraine over the jailing of former Prime Minister Yulia Tymoshenko, in a move that could push Kiev back into Russia’s orbit as it lobbies Moscow for cheaper gas prices. 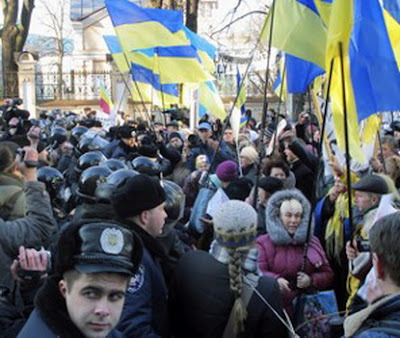 Ukrainians rally outside the parliament headquarters in support of jailed Yulia Tymoshenko, in Kiev, Ukraine Monday, Dec. 19. 2011 in Kiev, Ukraine. EU President Herman van Rompuy said that the long-awaited deal outlining political and economic cooperation between Kiev and Brussels has been finalized, but its signing hinges on Tymoshenko’s fate. “We want to take steps to sign and ratify the agreement as soon as we can, but this would depend on political circumstances,” van Rompuy said at the end of an EU-Ukraine summit. The EU and the United States have strongly condemned the October sentencing of Tymoshenko, now the top opposition leader, to seven years in prison on charges of abuse of office as politically motivated and demanded her release. Tymoshenko, who became an opposition leader after losing the premiership in 2010, was found guilty of overstepping her authority while negotiating a natural gas import contract with Russian in 2009. She charges that her longtime foe, President Viktor Yanukovych, has ordered her imprisonment in order to bar her from elections. Yanukovych has defied Western pressure to release Tymoshenko, saying prosecutors and courts acted independently in her trial. Moreover, Tymoshenko has been charged and investigated in scores of new criminal cases since her imprisonment and a court ordered her indefinite arrest as part of new probe, even if her current jail term is overturned. Ukrainian and EU officials had long planned to sign the agreement during Monday’s summit. Yanukovych expressed hope on Friday that the deal would be signed. The failure to sign it comes as major disappointment for Yanukovych, who has made membership in the 27-nation bloc a top priority. Tymoshenko’s jailing has presented the EU with a dilemma. Some experts believe the bloc should not be partners with a government that throws opposition leaders in jail. Others say that snubbing Ukraine would push it back under Russia’s influence as Kiev is courting Moscow for cheaper natural gas. Yanukovych reiterated Monday that Kiev is seeking a lower price and expressed hope that a new deal would be reached soon. High-level talks between Russian and Ukrainian officials are expected this week. Von Rompuy also called on Ukraine to implement legal reforms, ensure media and civic freedoms and conduct a clean parliamentary election next year. “The key to strengthening our relations is in the hands of the Ukrainian authorities,” European Commission President Jose Manuel Barroso said at a joint press conference at the end of the summit.